This Tuesday marked the official day that the Starbucks Pumpkin Spice Latte was released. Now I'm not a huge crazy PSL fan or anything (I will most likely be sick of it by mid October). 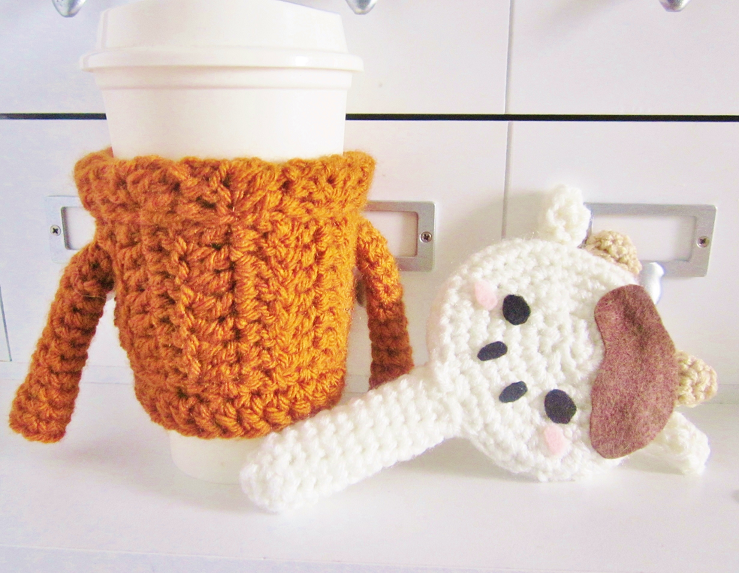 But I have crocheted a sweater coffee cozy inspired by a sweater the Starbucks PSL wore in a picture before, so if that tells you anything. I'm honestly just excited for the arrival of autumn because I hate summer! Hopefully drinking a few pumpkin spice lattes will make the time go by quicker. Last night I finished making that crocheted cow mirror. What do you guys think? I had this idea to give a basic hand mirror a crocheted cozy. I crocheted a cow because well you guys know I adore cows! I was going to crochet a while cow head and then stuff it but I felt that would make the mirror too bulky so I used felt instead. Would you like to see more, possibly in my shop? Thoughts? I love summer but this year it was too much! I cannot wait for Pumpkin Spice latte, I love it so much but it is still summer here in my country so I guess I will have to wait for a little more! Love little round up posts like this, they're a great source of inspiration. And your blog is adorable!